There was plenty of cheer down Lochter way last week with rod bending action but we were a bit let down on the weather front with frequent squalls and heavy showers. The weather obviously put the fish into feeding mode and they didn’t seem too concerned if the flies were presented top of the water or deeper down. 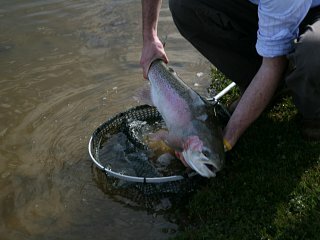 Ronnie Ewen got the week off to a good start with 22 fish all on nymphs. Davy Wood fished consistently with the WSW lure and brought 19 fish to the net and Colin McDonald had the same number but this time on cormorants with a floating line allowed to drift on the wind. Mike Frost on an outing with his mates from the Frigate Bar in Aberdeen let the way with 21 fish all on a black fritz and this was well celebrated in the timely Frigate manner. Looking through the returns book D McBain fished a team of diawl bachs to good effect and was rewarded with 13 fish, Bill Wood fished a bit deeper on bunny leeches and blobs and got 12 fish, John Rose fished a team of buzzers very effectively on the Muckle Troot and landed 12 fish. Colin McKinnon fished a variety of flies including the Montana, bloodworm and olive upwing to get 11 fish and Innes Simpson fished the top of the water and deftly landed 7 fish on a crippled midge. A last reminder that the September singles takes place this Sunday (17th of September) with a 9.30am start. There are still a couple of places lift so if you want to enter this popular competition then contact the Bothy on 01651 872787 to put your name down. It’s a very friendly event with generous prizes for the top 3 finishers. There is a saying that ‘ The breath of life is in the sunlight and the hand of life is in the wind’:- Here’s hoping for more favourable weather for the week ahead and the sunlight is the winner.